Conservation and conflict are irreparably linked as we address human’s widening impact on the planet. From a broader perspective we are moving forward as our new values and perspectives clash with the old. However, for those in the conservation trenches in may not seem like progress when being attacked at public meetings, creating enemies and, in some cases, receiving death threats. One only needs to recall loggers clashing with environmentalists over the cutting of redwoods, or farmers with fisherman over salmon, or protesters trying to shut down the Hawaiian aquarium trade to visualize these conflicts. It is the latter case that I focus on here. Although I didn’t know it at the time I was dragged into the aquarium fishery conflict by an innocent question at a public meeting in Kona in 1994: “What are we going to do about the destructive aquarium trade?” Twenty years and 25 scientific publications later I look back on my trajectory into that conflict as an amazing learning experience and one full of missteps, instinctive leaps, and some amazing ecology. My initial goal was to provide useful information to the State of Hawai‘i (specifically DAR, the Division of Aquatic Resources) so they could better manage the aquarium fishery. However, when scientists step into the public arena it irreparably changes the calculus of the science: how do your separate your personal values from objective research? If you want public trust how do you answer questions in public meetings that stray from science? These studies are challenging experiences for the natural scientists who participate, because traditionally scientists are not educated in technical aspects of policy development, the practice of politics, and interactions with other professional and social groups. … Natural scientists often lack communication skills relevant to policy development. The observation that many scientists fail to communicate — or to listen well — is not new. The communication problem can be major in interdisciplinary exercises. So despite the strong feelings I had to advocate for specific policy options, there are costs, both potential and real, associated with doing so. Many scientists feel free to advocate for what they believe in because it is their right as a citizen, others try to clarify their personal values as separate from their scientific research, and still others avoid advocacy completely. In my opinion there is no correct role to play in the public arena, they all have potential consequences that can influence how people trust me and my science. And regardless of what I do the public will perceive my trustworthiness largely based on their perceptions and biases, not mine. So here are my thoughts on walking this scientific tightrope. First, I provide some background on the aquarium trade in Hawai‘i then move on to my experiences and what I have learned. I don’t claim to have any answers to the ethical dilemmas encountered by scientists in the public arena, just ideas from my own experiences. In the 1970s aquarium collectors along the west coast of the island of Hawai‘i (hereafter, West Hawai‘i) developed conflicts with the rapidly growing dive-tour industry which were selling views of fishes on the reef. The conflict developed around the perception by the dive-tour industry that colorful reef fishes were dwindling due to collecting activities, thus diminishing the aesthetic value of the reef—a classic clash of conservationists’ (i.e., sustainable yield) versus preservationists’ (i.e., aesthetic beauty) worldviews. 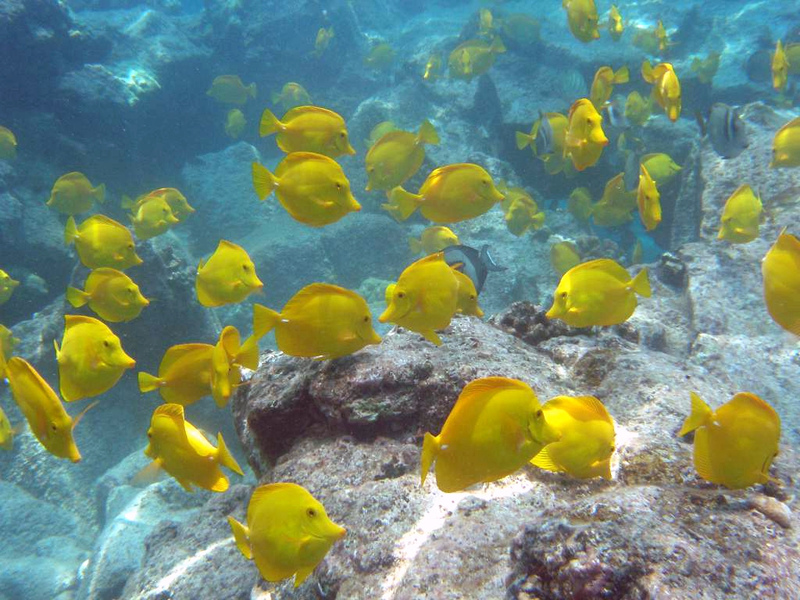 One rallying point of the conflict was the abundant, colorful yellow tangs that formed large schools at natural high densities and swarmed over the Hawaiian reefs. Yellow tangs in West Hawaii. Photo: Bill Walsh. Yellow tangs account for over 80% of the aquarium trade harvest in West Hawai‘i and thus numerically dominate the collector’s take. Although the conflict was recognized in the 1970s, the issue was not fully addressed for two decades and by the mid-1990s the situation had grown into a serious multiple-use conflict with threats of violence (Dybas, 2002). Because the state agency charged with managing fishery resources (DAR) repeatedly failed to resolve the conflict, pressure by local citizens’ groups (principally the Kona-based Lost Fish Coalition) resulted in several bills submitted to the Hawai‘i state legislature in 1997 to ban collecting or to establish areas closed to collecting, or Marine Protected Areas (MPAs), called Fish Replenishment Areas in Hawai‘i . Washington Post article on West Hawaii (2002) By Cheryl Lyn Dybas. My involvement with the West Hawai‘i aquarium trade started in 1995 when I was at the Univ. of Hawai‘i at Hilo where fellow marine ecologist Leon Hallacher and I were invited to a meeting hosted by the Hawai‘i DAR and then Hawai‘i House of Representative member David Tarnas. Tarnas and DAR biologist Bob Nishimoto asked us to design a study to assess the effects of the aquarium trade on fish populations in Kona to address the issue. At that time there was significant pressure on both sides of the conflict to take action but no data on which to base a decision. Our study, which ran from 1996-97 (Tissot and Hallacher, 2003) showed significant high impacts of collectors at two sites in Kona: seven of ten reef fish species surveyed were 38-97% reduced relative to sites protected from collectors; importantly we found a 46% reduction in the yellow tang. In 1997, while Tarnas was working on his bill to address the issue in the state legislature we sent him our preliminary results to bolster support for the bill and later gave three public talks in West Hawai‘i to disseminate our results (see below). His bill passed to become Act 306 which created a fishery management area along the entire 200 mile coastline of West Hawai‘i and closed 35% to aquarium collecting using MPAs. This accomplishment was an unprecedented event in Hawai‘i, even to this day. Yea! Science saved the fish and the environmentalist’s loved us. Not so, of course with the aquarium fisherman, who were now limited to 65% of their previous fishing grounds, most of which was at significant distances from their traditional areas (Stevenson et al., 2013). West Hawaii newspaper announcing the results of our fish collecting impact study, 1999. Scientific publication by Rossiter and Levine (2014) evaluating the West Hawaii MPAs. But despite success on the reef there were lingering problems in the community and conflict persisted. As it turns out (surprise!) real, more permanent conservation takes considerable time as attitudes and beliefs (on both sides of the issue) change slowly (see Riddell, 2005 for an excellent example in the Great Bear Rainforest). Too many fish were still being taken from too many species. However, over a seven-year period a compromise was forged on the West Hawai‘i Fisheries Council — a dedicated group of diverse stakeholders in West Hawai‘i that meet monthly to resolve resource conflicts — limiting collection to just 40 of the hundreds of species collected; a “white list” which reduced the impact to a small subset of species. It wasn’t a perfect solution but a comprise between conservationists and fisherman to limit the impacts of the trade. Other changes included daily bag limits for yellow tangs and other concessions which improved the fishery. It was slow but it was progress. More importantly, members of the community were working together to responsibly and adaptively manage the aquarium industry, despite their disagreements. This in itself can help reduce conflicts and promote sustainability. But the “fun” was just getting started: enter Snorkel Bob and his legion of the Maui faithful including his mouthpiece Renee Umberger from ForTheFishes. They are united by the single concept that the aquarium trade “or wildlife trafficking” as they call it is evil and needs to be eliminated from Hawai‘i. Although their position is largely an ethical issue their tactics are based on science: fish mortality rates, coral reef health, and sustainability to name a few. These are clearly data-driven issues that we have studied for decades but our results are ammunition they use to justify their position. It is war, and the enemy are the aquarium collectors and anyone that supports them. To be crystal clear, I have never publicly supported any position, neither environmentalists nor fishers, my support has always been about the science. What I support is the idea that good data should be used to make informed decisions about scientific issues. I am above all an advocate for the science. Of course from other viewpoints, depending on the study and the results this can be construed as support one way or another, which it is. And thus there’s the rub: as much as scientists strive to be neutral in the public arena we are not. The questions we ask, the methods we use, the results we present, all have consequences in the real world. Thus, it appears that spatially separating opposing user groups [via MPAs] may reduce interpersonal conflict, but its efficacy for managing conflict remains questionable when social values differences between groups prevail. Despite decades of research in West Hawaii conflict around the aquarium trade persists — despite a large body of research. Flyer for a public meeting in Kona in 2012. So, since 2009, as Snorkel Bob, Renee and their associates has tried to shut down the aquarium industry through ongoing battles in county councils and the state legislature. These challenges have been based on “improving management”, promoting a “sustainable trade”, promoting a “humane trade” and outright bans on the fishery as well as a lawsuit. All well crafted and most based on personal perceptions, inappropriate use of data, or no data at all. As a result, I (and many others) have been engaged in writing testimony that urges politicians to make decisions based on the science. Now, of course, the aquarium fisherman see me as their ally, someone on their side. But again, I am just defending the idea that these important decisions should be based on scientific data, not rhetoric. But for now the fight goes on despite success on the reef. Perhaps the fishery will survive for now. It is a business in Hawai‘i that generates revenue and owning an aquarium can be an important educational experience to many people that may never be able to snorkel the reefs, However, given our changing ethics I’m not sure the trade will last in the long run. A hundred years ago we thought nothing about hunting whales, which is considered abhorrent to most people these days. As our empathy for other creatures grow we are placing increasing scrutiny on those activities that impact living creatures, as we should. And the rhetoric, however subjective, tugs at our emotions, our heartstrings. For in the long run, the millions of people who benefit from watching schools of colorful fish on the reef, outweighs the 30-50 collectors that benefit from the trade. In the meantime we work towards a “balance” among competing interests where there is unlikely a balance to be found. But the real tragedy is that the compromise worked out over many years by a small group of diverse stakeholders through a community-based process may be a casualty of Snorkel Bob’s campaign. Because in the long run the process that produced a compromise between fisherman and conservationists in West Hawai‘i has the greater promise for promoting the long-term sustainability of marine resources than any ban might have. Dybas, C. L. 2002. 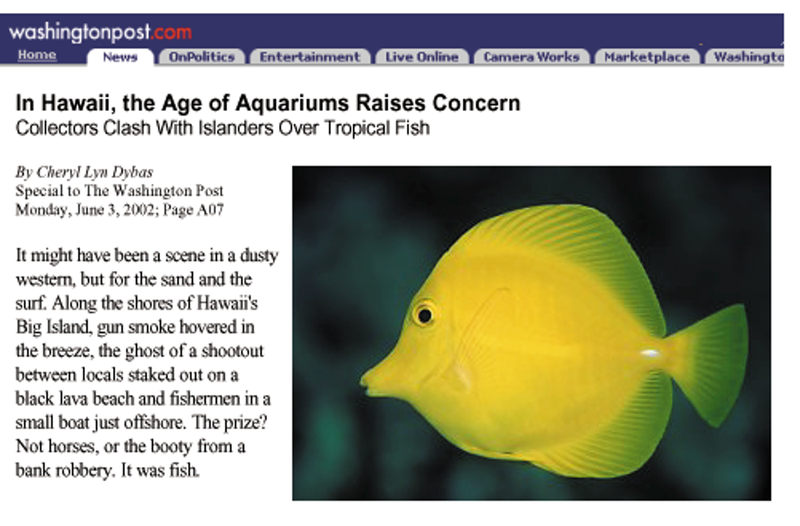 In Hawaii, the age of aquariums raises concerns: collectors clash with islanders over tropical fish. Washington Post, June 3, 2002, A7. Riddell, D. 2005. Evolving approaches to conservation: Integral ecology and Canada’s great bear rainforest. World Futures 61: 63 – 78. Rossiter, J. S. and A. Levine, 2014. What makes a “successful” marine protected area? The unique context of Hawaii′s fish replenishment areas. Marine Policy 44: 196–203. Stevenson, T. C. and B. N. Tissot. 2013. Evaluating Marine Protected Areas for Managing Marine Resource Conflict in Hawaii. Marine Policy. 39: 215-223. Stevenson, T. C., B. N. Tissot and W. J. Walsh. 2013. Socioeconomic Consequences of Fishing Displacement from Marine Protected Areas in Hawaii. Biol. Conservation 160: 50-58. Tissot, B. N. 2005. Integral marine ecology: community-based fishery management in Hawaii. World Futures 61: 79-95. Tissot, B. N. and L. E. Hallacher. 2003. The effects of aquarium collectors on coral reef fishes in Hawaii. Conservation Biology 17(6): 1759-1768. 1. It’s not just Snorkel Bob who opposes the trade’s current exploitation of Hawaii’s reefs for aquarium hobbyist amusement, it’s numerous Hawaii, national and international NGO’s and community groups, including: For the Fishes, The Humane Society of the United States/Humane Society International, Conservation Council for Hawaii, Center for Biological Diversity, Earthjustice, Sierra Club, Kai Palaoa, Ocean Defender – Hawaii, Olamau Canoe Racing, leaders in the traditional Hawaiian fishing village in Milolii, Hawaii, West Hawaii Humane Society, etc… to name a few. Add to that several governmental bodies urging a total ban on the trade, statewide: Kauai County Council, Hawaii County Council, Maui Governor Alan Arakawa, plus, thousands of individuals who’ve submitted letters, cards, testimonies, etc. in recent years opposing the status quo as proposed in the rules and urging strong regulations that deal with the environmental, ethical and cultural issues posed by the trade. 2. It’s not the science that’s in dispute, it’s the interpretation, bias and spin that accompanies it. Of course the 35% closure and yellow tang recovery represents a conservation success in the closed areas. But your own bias causes you to miss our main points, founded in the data and info presented by DLNR/DAR, and backed up by the collection reports: millions of fish are missing in areas where AQ collectors work; in those areas, yellow tangs, for example, are down by as much as 80% in some years; some species (once heavily targeted) are disappearing; others are threatened and in need of conservation action to prevent extinction risk (the AQ trade is identified as the only cause); some of those very species were included in the flawed White List you mention. The White List was designed to keep the AQ trade revenue at 99%, so that’s not much reduced impact for years of effort. Where’s the balance? 3. Sustainable yield has not been identified for the herbivorous species heavily depleted by the collectors. In fact, the state recently acknowledged that it is operating without a definition for “sustainable” in this context. A definition for sustainable that includes important family roles in complex coral reef ecosystems and maintains abundance so that the aesthetic value is not unduly diminished is an important next step. 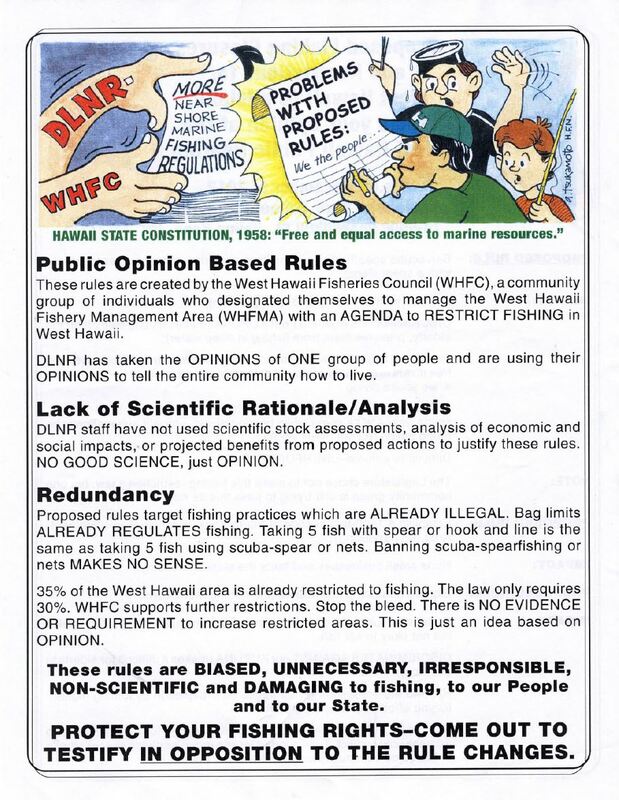 The only way to achieve this will be to consult closely with those who’ve been traditionally ignored by DAR, the West Hawaii Fisheries Council and others “working towards a balance among competing interests”. 5. It’s one lawsuit, not numerous, and Snorkel Bob is not a plaintiff. 6. The fragility of Hawaii’s coral reefs is reflected in the fact that 30 people are having such a profound impact on the majority of West Hawaii reefs. Hawaii’s yellow tang is likely among the top 5 most demanded fish by hobbyists. Their lifespan potential in the wild is 40 years. I challenge anyone to find even one 40, 30, or 20 year old yellow tang in a hobby tank. Sure, you may find one or two 10 year olds, but out of millions that were captured and shipped off, it’s not worth mentioning. 7. At least 3X more fish are captured for aquariums in West Hawaii than from the entire Great Barrier Reef. Where’s the balance? Once again we find Rene, a complete non-scientist, telling a PhD in marine biology that the doesn’t know how to interpret his own data. In the blog, our PhD talks about interpretation of the data and how difficult it is to maintain objectivity; he is,however, completely dedicated to the science and tries to be as faithful to the data as possible. However, because it doesn’t say what Rene wants it to say, she calls it “spin,” etc. In the Hawaii County Council meeting which I attended, the Humane Society of the United States allowed their “pet scientist” to make an appalling presentation, which included deliberate misrepresentation of quotes and “facts” from scientific papers (I looked up the references) and virtually all of the “facts” she presented as being pertinent to West Hawaii were, in fact, from the Golden Triangle island nations in the South Pacific. Many other statements she made were apparently made up, whole cloth, with no citations given. In my opinion, Dr. Teleky should be reprimanded by the scientific community for knowingly presenting false data to a government body. In the long run, however, the County Council didn’t buy it. The introducer of the bill was chastised by another councilmember for wasting so much of the Council’s and the public’s time. So, when Rene talks about “spin,” and when she starts throwing around numbers, take it with a giant cup of salt water.